I can't remember if this site has been posted about already, but it's amazing. That is George Washington's description of the Great Meadow, in southwestern Pennsylvania. It was here, in 1754, that he built Fort Necessity and garrisoned it with 100 British Regulars and 300 Virginia militia. 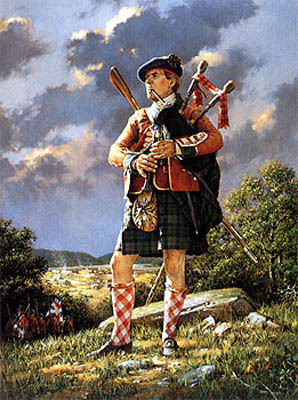 Alas, Fort Necessity was poorly positioned, and forced to surrender by French and Indian troops. Hey, I saw the original one 2 weeks ago at the Canadian War Museum, they currently have an amazing exhibition on the French and Indian War, called "Clash of the Empires". They managed to collect a great number of those paints you so often see printed in books (such as Montcalm's portrait, "The death of general Wolfe", Washington's portrait in his blue regimental coat, and so on...). Here is one I really love. 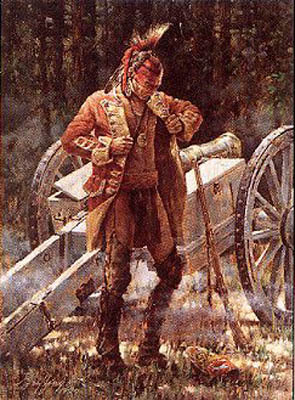 It's called "The victory coat", and pictures and Indian warrior taking a grenadier's coat after Bradddock's crushing defeat at the Monongahela, the 9th of july 1755, near Fort Duquesne. TiFlo wrote: Here is one I really love. Now that is a great picture. The Battle of Bunker Hill by Don Troiani.